To your left is the international symbol for customer service: Smiling, good-looking person with telephone headset. Now, slap yourself or slam your hand in the car door or whatever it takes, and come back to reality. What they’re really saying (and some will come right out and say it) is that they like talking to a real person who knows what the heck they’re talking about and works with them diligently through resolution of their problem. As marketers, we must continue to extend the marketing conduit from the top of the value chain-procurement-to the front of the chain-sales and customer service. Marketing is as much customer service’s business as customer service is ours. We must demand, even more loudly than our customers, that complaints are handled expeditiously and problems are anticipated. At the same time, marketing must hear the customers voice when sales and customer service raise concerns of their own. Is it any coincidence that great brands like L.L. Bean, Lexus, Trader Joe’s, Starbuck’s, Publix, Southwest Airlines, Apple and Chick-Fil-A are perennially found on the lists of customer service champions like this year’s BusinessWeek list? Starting Monday, we will feature excerpts from our interview with Janet Rine, owner of Caffe Moderne. Our discussion centers on what it takes to earn the trust of an independent owner/operator. Whether you sell meat, beverages, spices or mixes, you won’t want to miss it. And no, “weeding” in this case doesn’t have anything to do with gardening or the Black Crowes. In this case, according to Yankelovich MONITOR, it means being “blackballed” for superficiality in favor of substance and accountability. In today’s world of myriad choices, it’s easier than ever for consumers to walk away from brands, restaurants and retailers that they don’t see as honest. After all, why exert the energy and spend the time when you can walk to the other side of the mall or click to another window and get something better. Hire great people. Restaurants, retailers and manufacturers are all guilty of placing too little emphasis on hiring, training and retaining talented and passionate brand ambassadors. Trust us, your more successful peers and competitors do this. No excuses, now. Fix it. Remove the word “no” from your vocabulary. You have two choices. Make it happen or be willing to risk the customer moving on to something better. Don’t wait for them to ask you. If there’s even a slight chance a question might arise, publish an answer to it on your Web site and prepare your people to be able to answer it. Show caring through customization. Every neighborhood is different. Every market segment is unique. That’s why they’re called neighborhoods and segments-because they’re full of neighbors and segs who want something a little different. Wherever possible and profitable (especially long term), give it to them. It shows you care, and it builds loyalty. Have a profitable, customer-focused, consumer-friendly day. In one of our first posts, we addressed the problem of obesity in this country, trying to add a dose of sanity to counter the notion that the food industry is solely to blame for it. We pointed out that the decisions people make about diet and exercise, along with genetics, also factor into the equation. But basically, it’s calories in, calories out. If you’ve been following the Olympics this week, you might have heard that 14-time gold-medal-winning swimmer Michael Phelps eats 12,000 calories a day to keep his engine going. Phelps also swam about five miles a day during the Olympics. If that sounds like a lot of exercise, that’s because it is. To put it another way, conventional wisdom is that swimming five miles is like running 20 miles. Imagine running 140 miles in a week. Unlike Phelps, most of us need far fewer than 12,000 calories to keep our motors running. In fact, the United States Department of Agriculture and the United Nations Food and Agriculture Organization say the average American consumes about 4,000 calories a day. We talk a lot in our business about share of stomach. Usually, we’re talking about our share versus our competitors. We ought to be trying to learn what types of emotions and activities are responsible for what percentage of our target consumers’ caloric intake. Make sure you’re taking a detailed account of WHY your customers are buying and consuming your brands. At every point possible in the buying process, take advantage or opportunities to ask questions. Put questions on coupons. Offer discounts for answering questions. Put surveys on cash register receipts. This next part will seem a little foreign to some people. Rather than asking about satsifaction with the product, ask your consumer about themselves. Ask them why they made the purchase when and where they did. People would much rather talk about themselves than you. It’s a natural thing to ask, and the answers will tell you the language, tone of voice and venues in which to best communicate to your targets when they’re making their food choice. Have you hugged your logistics manager today? We do a lot of work for a lot of different clients, including food clients. But most all of our clients do some sort of manufacturing. And that means they have stuff to deliver. And sometimes, the wrong stuff is delivered. Or the right stuff is delivered at the wrong time. Or both are wrong. It can get ugly. But here’s a little something we’ve learned for you to chew on today. It comes from talking with loads of procurement people and buying decision-makers in many channels and industries. People make mistakes. Buyers understand that. But they would rather buy from honest people who admit their mistakes and try to help fix them. We tried a great little restaurant last night in the Little Apple (that’s Manhattan, KANSAS, if you’re keeping score at home). Bottom line: Tasty and fun but slightly overpriced. Hu Hot is the latest iteration of the Mongolian grill for the American masses. Greater numbers of people seem ready to embrace the concept of putting your food in a bowl and carrying it to someone so he can cook it for you while you stand there and wait for it. There have been others before it, but Hu Hot might have the timing right. The Spoon’s most important observation about the concept is that it delivers intense flavor, an exotic menu and an interactive experience in a relatively small physical footprint. This location was tucked away in the front corner of a shopping mall, and it was not roomy inside. Two servers, two cooks and one go-fer in the back had a crowd of 60 diners easily covered. To give you an idea of the overall experience of eating at Hu Hot, we’d tell you that the food was fresh and hot. The flavors were true to their respective Asian heritage of Thai, Sechuan and Japanese. It was a bit more down to earth than P.F. Chang’s, like they’re not trying to impress anyone. 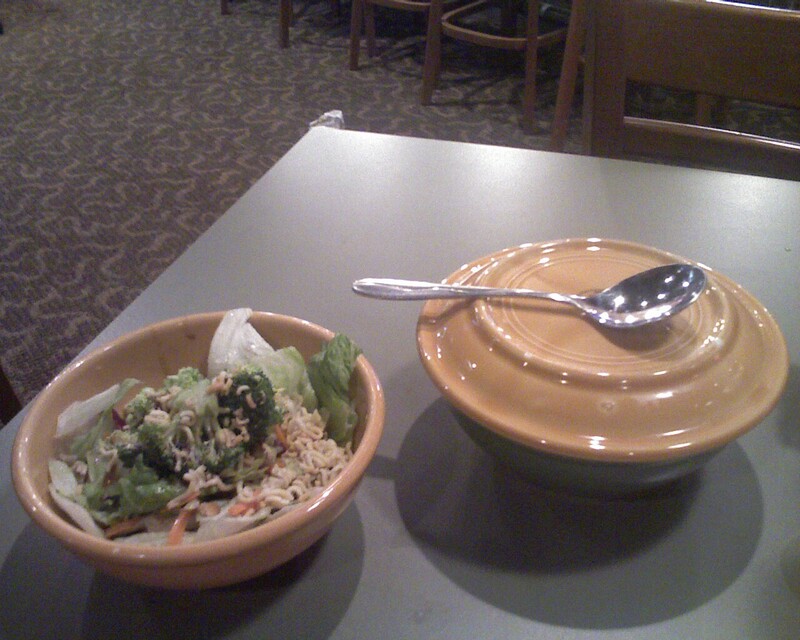 A bowl of rice and your choice of soup or salad accompanied the meal. As far as preparation, stuff that was supposed to be gingery was gingery, and stuff that was supposed to be crispy was crispy. 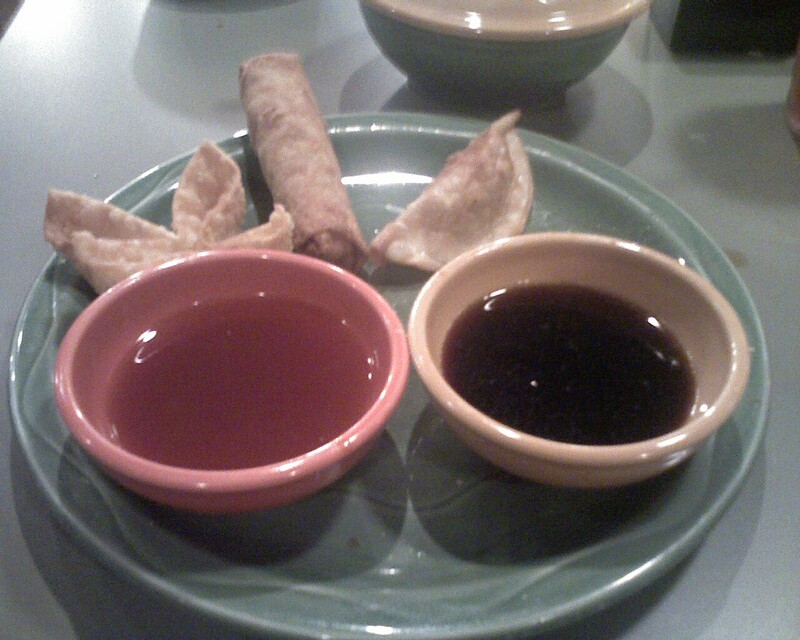 But there were some twists, such as just enough chili in the fried spring roll to sting your lips a bit. Tasty. When it came time for throwing sauce on the stuff in the bowl, we chose pork and pad thai noodles with a few veggies. While traditional Mongolian grills have stuff like “garlic water” and “sa cha,” Hu Hot allows you to play around with combining flavors like Black Thai Peanut, Yellow Belly Curry and Feed the Hordes Hoisin to create crazy-tasty fusion. Make your own or try it The Spoon Way: 3 ladles Black Thai Peanut, 1 ladle Feed the Hordes Hoisin, 1 ladle sweet red chili, 1 ladle ginger. A very nice Thai-style complement to pork pad thai. The actual cooking was like any other Mongolian grill, if you’ve seen it. Two guys with spatulas turn your stuff over and over on a large round grill until it’s done. Try the appetizer sampler to share with your family or group. The most compelling item is the potsticker that’s fried Rangoon-style. For dessert, the 5-layer chocolate cake, called Choco Khan, will rock you.